You are currently browsing articles tagged George Whitefield. To George Whitefield, a spiritual battle was commencing between the angel Michael and the devil himself as a result of these Log College graduates going out into the world. Yet the great revivalist was confident that God would prevail in the coming struggle. D. L. Moody is reported to have said, “The world has yet to see what God can do with a man wholly committed to him.” With all due respect, I think Mr. Moody overlooked a fair number of men, sold out to the Lord, wholly committed in all their labors. George Whitefield was one such man. On this day, October 14th, in 1770, the Rev. James Sproat brought a memorial address occasioned by the then recent death of Rev. Whitefield. While Whitefield was himself an Anglican, his influence among Presbyterians in the American colonies was extensive. What follows is but a small excerpt from that sermon. To read the full text of Rev. Sproat’s sermon, click here. George Whitefield departed this life (according to our public accounts) on the 30th of September last, at Newbury Port, in the Province of Massachusetts Bay, in New-England, by a sudden and violent fit of the asthma. As to his person, we have all of us had frequent opportunities of admiring his graceful countenance and manly deportment; which commanded reverence and respect; excited esteem and affection in persons of every rank and quality.–His birth, parentage, and education, the world has long ago been favoured with accounts of, in his printed journals.—He early discovered a singular taste for science, joined with a sprightly and florid genius. His education was completed at Oxford, one of the most illustrious universities in Europe.–It pleased God, who designed him for very great and eminent services in his church, early to change his heart by the power of Divine grace; and by a thorough and remarkable conversion, to turn him from darkness to light, and from the power of Satan unto God; that he might receive forgiveness of sins, and an inheritance among them that are sanctified by faith which is in Christ Jesus. Thus all the powers of his mind became strongly engaged to the study of divinity. The important doctrines of grace, and the admirable scheme of redemption by the Lord Jesus Christ;—the condemned, miserable state of sinners;—free justification by the imputed righteousness of Christ received by faith alone;—the powerful operations of the holy and blessed Spirit to regenerate and sanctify the human heart, were subjects of his most solemn and delightful contemplation. Under the lively impression of those things, his pious heart was turned to the great work of the Gospel ministry. In this important business he engaged, and to this glorious work he devoted himself, as soon as the rules of that church, of which he was a member, would permit. Being good man, and full of the Holy Ghost and of faith; fired with a flaming zeal for his Lord and master; filled with bowels of tender compassion to immortal souls; and favoured with more than Ciceronian eloquence;—he soon became the wonder of the world as a preacher. The attention of persons of all ranks, sects, and denominations, was attracted by him. And the hand of the Lord was with him in such a powerful manner, that great numbers were presently joined to the Lord by his ministry. Though he always manifested a peculiar regard for the Church of England, in which he had been educated; yet as he set out in the ministry upon principles truly catholic and noble, so he steadily and vigorously retained them to his expiring moments. Pursuant to these principles of catholicism, he was determined not to know any thing among the people, but Jesus Christ and him crucified. Upon this plan he let out; and upon this plan he prosecuted the great work of preaching the gospel to all sorts of people that would give him an hearing. To Jews, infidels, freethinkers, as well as to all denominations of Christians without exception. And this grand business of publishing the gospel of peace he pursued for a great number of years with the most indefatigable assiduity, prodigious eloquence, and flaming zeal, through England, Scotland, Ireland, and the widely extended dominions of British America. As a speaker, he was furnished with such admirable talents, with such an easy method of address, and was such a perfect master of the art of persuasion, that he triumphed over the passions of the most crowded auditories, with al the charms of sacred eloquence.—He was of undaunted courage and heroic resolution, in the cause of his divine Master. Nor the frowns, nor the flatteries of the world; with all its insults and outrages, its allurements or charms, could ever turn him aside from endeavouring to win immortal souls to the Lord Jesus Christ. We urge you to read on. This is but an excerpt, pp. 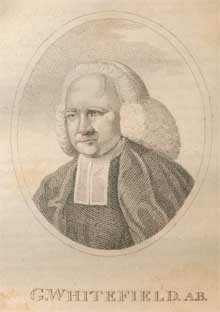 16-18, from A discourse occasioned by the death of the Reverend George Whitefield, A.M., late Chaplain to the Right Honourable the Countess of Huntingdon : delivered October 14, 1770, in the Second Presbyterian Church in the city of Philadelphia. (1771), by the Rev. James Sproat [1722-1793]. Blair was born in Ireland in 1712, and brought to America in his youth. He was a Log College graduate, and licensed by the Presbytery of Philadelphia in 1733. He was ordained and installed as a pastor in New Jersey in 1734. Five years later, he answered a call to serve the Faggs Manor Presbyterian Church, just south of Cochranville, Pennsylvania. The church had been founded in 1730, and had been ten years without a shepherd. Rev. Blair was led to receive the call and thus came to this church. Words to live by: Pray diligently for our teaching elders and congregations, that we would first humble ourselves, confessing our sins, and seeking the Lord, that the Lord would draw us near, and that we would grow in the grace and knowledge of the Lord Jesus Christ as we sit under the faithful proclamation of the Word of God. The Presbyterian preacher and pastor didn’t make it to age forty. But his almost four decades was filled with work for the Savior in His church. 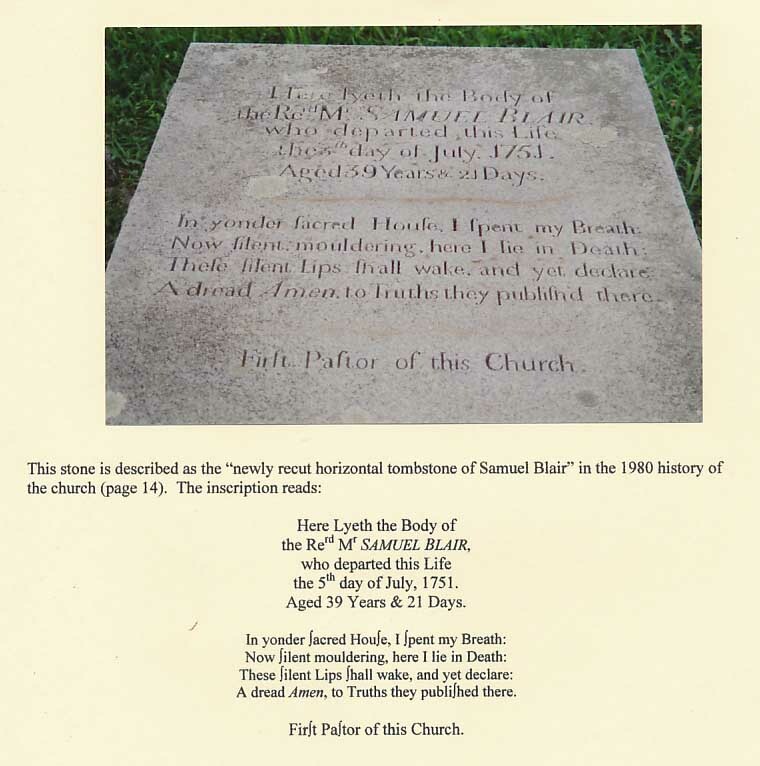 Our focus for This Day in Presbyterian History is Samuel Blair. Born June 14, 1712 in Ireland, Samuel traveled to America when he was quite young. He received his classical and theological education in the school of the Rev. 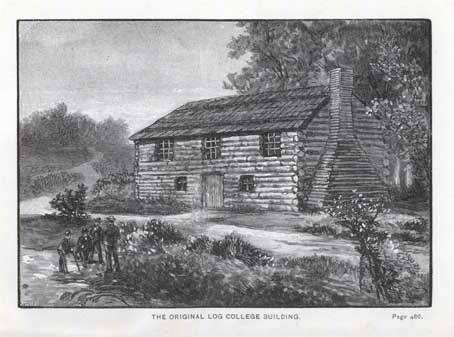 William Tennent, Sr. at Neshaminy, Bucks County, Pennsylvania, a school which later became celebrated as the Log College. When he finished his training, he was licensed to preach at Abingdon, Pennsylvania by the Presbytery of Philadelphia on November 9, 1733. For five years, he labored as a pastor in a double charge in the Presbyterian churches in Middleton and Shrewsbury, New Jersey. The people of those congregations were said to be very irreligious. Not much spiritual fruit was registered in his ministry among them. But then a call came from Faggs Manor Presbyterian Church in eastern Pennsylvania. The Presbytery of New Brunswick, of which he was a member, advised him to accept that call, as they were convinced that a wider field of usefulness would be found there. To Faggs Manor then in 1739, Samuel Blair went, and after one year, he began his ministry in 1740. Samuel Blair would be the first pastor they had, even though they had been in existence for ten years. Preaching to a congregation in which Blair later on characterized as “religion lay as it was a-dying,” the Holy Spirit began after four months a spiritual awakening in their hearts and minds which later on would be part of the first great awakening in the colonies. 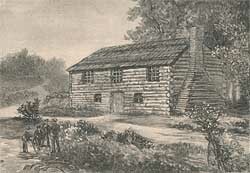 Faggs Manor Presbyterian would be the middle location of that awakening which took place from Massachusetts to Georgia. The same year of 1740, on two occasions in May and November, evangelist George Whitefield would preach at Faggs Manor Presbyterian Church as a guest evangelist. This author has stood many times on the property of this congregation at approximately the same location where this spiritual awakening took place. He has on many a day imagined in his mind’s eye the twelve thousand people in attendance responding in repentance and faith at the powerful peaching of the Word of God. And Samuel Blair himself went around the colonies, preaching the same good news of eternal life, extending that which the Spirit of God began in earnest that year. Evangelism and equipping. The two go together, in that our Savior in His Great Commission commanded us to “go and make disciples.” Don’t misread it to say, “go and make decisions.” Biblically, disciples are made, not born. Note: Faggs Manor Presbyterian Church is the second oldest Presbyterian Church in America congregation, having been organized in 1730. It is now called simply Manor Presbyterian Church. WLC 142 — “What are the sins forbidden in the eighth commandment? WSC 75 — “What is forbidden in the eighth commandment?